Australia won the second test match at Chittagong and saving themselves from an embarrassing series loss from Bangladesh's hand. Nathan Lyon and David Warner were the main stars for Australia. Nathan picked his first10-wicket haul in a Test match in Asia. He picked 7 for 94 in first innings and 6 for 60 in second innings. David Warner hit 123 that got Australaia a crucial 72 run lead in first innings. For a city that has grown up on the stories of its glorious cricket history of 1940s and 1950s, the callings of Twenty20 were still relatively unknown for Indore. Hosting Kings XI Punjab for the first time, the locals had happily sworn their support to the opposition in the opening game, that had in its rank MS Dhoni. However, by the time the match ended, Glenn Maxwell happened the way the 'Big Show' loves to happen. It was a brief blitz, studded with four sixes, but enough to leave the feeling still lingering at the Holkar Stadium. They are now set to host Royal Challengers Bangalore. On another day, Kings XI Punjab would have been left feeling like visitors again. However, without Virat Kohli and AB de Villiers, Bangalore have lost a bit of sheen on their star power. Nonetheless, just like Kings XI Punjab, the visitors too will be coming into the match at the back of a well-fought win. For the first time since the second season, Bangalore are relying heavily on their bowlers to pull them through. Tymal Mills has been exceptional with his pace variations, Yuzvendra Chahal has been tight and Shane Watson is being consistently inconsistent but on a good day, the stand-in skipper can be a match winner with the ball too. The fact that they managed to defend 157 at M Chinnaswamy stadium is a fine testimony of the skill and form of their bowling unit, especially coming at the back of a season where they were finding it difficult containing the opposition for less than 180. Punjab, on the other hand, are expected to play an unchanged squad. The Indian bowling unit - Sandeep Sharma, Mohit Sharma and T Natarajan bowled in good channels and made it difficult for the likes of Ajinkya Rahane, Steve Smith and MS Dhoni to break free. With Bangalore boasting of a top order that likes to attack - Chris Gayle, Watson, Kedar Jadhav and Mandeep Singh, a few dot deliveries early on could add some pressure, with which they can look to dominate. Sandeep and Mohit will have to play a key role if the hosts have to register their second successive win. There was a bit of confusion over how much grass covering and moisture should have been left on the wicket in the opening game with captain Glenn Maxwell and team director Virender Sehwag offering different instructions to the curator. What eventually opened up was a two-paced track to begin with, which flattened out in the second half. The directions, however, are much clearer for the encounter against Royal Challengers Bangalore. The hosts have played two high-scoring practice matches and they have asked for a similar pitch for the encounter against the Shane Watson-led side Bangalore. In the absence of de Villiers and Kohli, Maxwell and Co. are willing to take on a big-total challenge. With only a day's gap between their two games, Royal Challengers Bangalore decided to skip the practice session on Sunday and opted to rest. So they are unlikely to be familiar with the conditions. A flat track and a tinge of grass is expected to be offered to the teams on the match day. There wouldn't be much turn, but that shouldn't be a matter of worry for the likes of Axar Patel and Yuzvendra Chahal, who bowl a flat trajectory. How well they adapt to these conditions, remains to be seen. What to expect: Conditions would be much cooler on Monday. A flat track is expected to be offered with a tinge of grass. A run-fest is expected. History: Kings XI Punjab have usually dominated the head to head battles against Royal Challengers Bangalore, winning 10 out of the 18 matches played between the two sides. However, in the last two years, Royal Challengers have managed to beat Kings XI thrice in four encounters. Kings XI Punjab: The hosts are expected to play an unchanged squad, with possibly Swapnil Singh making way for Gurkeerat Singh. Darren Sammy hasn't joined the team as yet. Details on his availability for the season is expected to come out shortly. Royal Challengers Bangalore: Given the conditions, Travis Head could be considered in place of Billy Stanlake, but otherwise it should be an unchanged squad unless AB de Villiers is fit to take part. The South Africa batsman has indicated that he is 'close to 100 percent fitness.' And his return, if it happens, will be a big boost for RCB although they will still be left with a combination conundrum. Gujarat Lions all-rounder Ravindra Jadeja is in line for a return in the franchise's next game of IPL 2017 against Rising Pune Supergiant. Jadeja missed the Lions' opening two fixtures against Kolkata Knight Riders and Sunrisers Hyderabad after being advised rest by BCCI's medical team in the aftermath of India's taxing 13-Test home season. Brad Hodge, the team's head coach, confirmed the development in an interview during Sunday's clash against Sunrisers. Dwayne Bravo, the other big-name absentee from the playing eleven due to a hamstring injury, is still some time away from making the squad. "I'm not sure about Bravo but Jadeja comes back for us in the next game," he said. "Without Jadeja... it's probably hurt us a little bit there. He's a player you can't actually replace. He bats, bowls and field. "Hopefully we get Jaddu back in, it might make a difference"
Jadeja's presence is likely to bolster a beleaguered Lions attack that has managed to take only one wicket from two games so far, both of which the Lions lost with hefty margin of defeats. Lions have a four-day break before they play three games in the space of four days, starting with the April 14 clash against Pune. In what could be a big blow for Kolkata Knight Riders, star opener Chris Lynn took a bad fall while attempting a catch against Mumbai Indians and was forced to leave the field. Lynn was later seen having his left arm, and shoulder, protected with a bandage. The same shoulder has been a cause of worry for the big striking right-hander over the years. He had a surgery on the shoulder in 2014 and suffered a dislocation in the following year. The latest incident occurred in the fourth over of the Mumbai Indians' innings when Lynn ran back from mid off to try and catch a skier off Jos Buttler. The subsequent dive and fall, however, caused Lynn to immediately signal for the physio to come on. He left the field without making an attempt to move the arm. The nature of this injury is yet to be ascertained but Paul Chapman, the strength and conditioning coach of Brisbane Heat and Mumbai Indians, was there to assist Lynn. The 26-year-old will have his injury monitored by Heat, the team he represents in the Big Bash League. "We'll stay in close contact through this initial process as we get an idea of what the extent of the injury is and what the options are for him," Heat General Manager Andrew McShea said on Monday (April 10). "It's unfortunate for Chris to sustain another injury to the shoulder that has troubled him in the past. It's not the sort of birthday you would wish for, and the best wishes of the club and our fans go out to him." 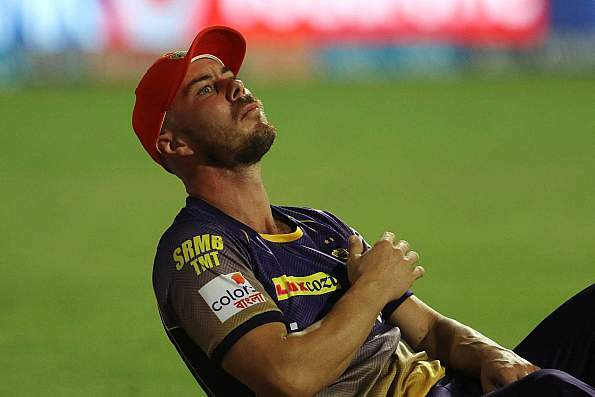 Lynn, who started the IPL season with a blistering 41-ball 93 against Gujarat Lions, has already established himself as a key part of KKR's plans and they'd be hoping that this injury doesn't put a spanner in the works. iplcricket2020. Awesome Inc. theme. Powered by Blogger.